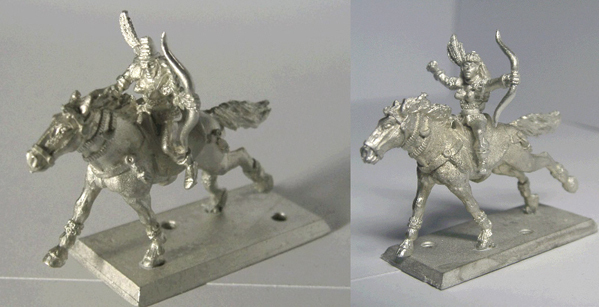 Now two separate companies, some of the old Ral Partha miniatures are carried by both companies, including a Glorantha Amazon guard and two Amazon Horse Archers, though Iron Wind sell the horse archers as a pack of six. 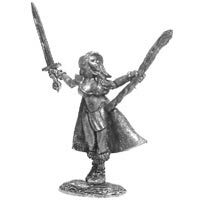 Both companies were carrying the Mage Knight metals range of figures, but Iron Wind's range seem to be limited now, although Ral Partha Europe still sell the Amazon Blademistress in plate armour and the more fanciful Amazon Queen. That's it for miniatures common to both companies, but there's a shortage of photos on the Iron Wind site so there may still be some figures sold by both companies below. 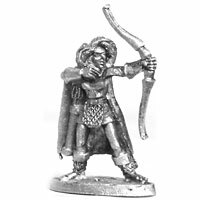 Iron Wind have assembled some Amazon army packs with twelve figures in each, including archers, elite and swords. There's no indication on the site of variety of poses etc. 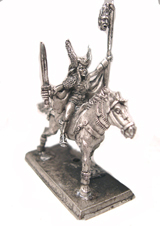 To lead the army there is an Amazon Queen and magic is provided by K'tara the Amazon mage. 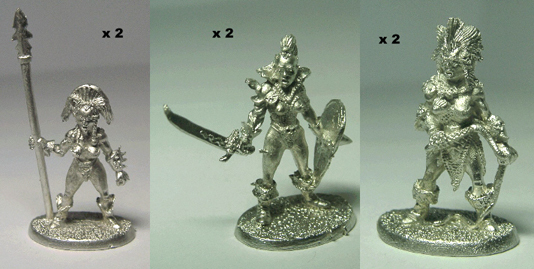 In their Chaos Imperium range, Ral Partha Europe has three Amazons available individually or as a pack of six (!). These have a bit of a meso-American feel to them, unlike the Amazon Queen which has more of an African look. 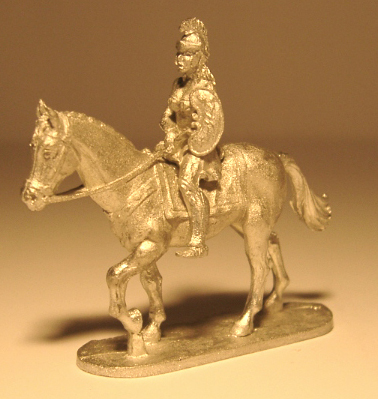 This German company seems to have gone kaput, but Ral Partha Europe have a large stock or are continuing to produce the range, including this mounted Amazon in Greco-Roman style armour and a kidney bean shield. The tow Amazons in the Armalion range are similarly styled but more dynamically posed. A very different slant on Amazons here with Obelisk's Darkest African Fantasies, ideal for pulp games as well as fantasy armies. 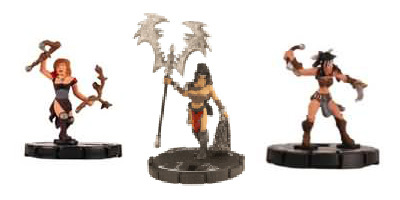 The range includes an Amazon champion, 6 young Amazons and 6 elite Amazons with separate shields and spear variants. Very unusual. 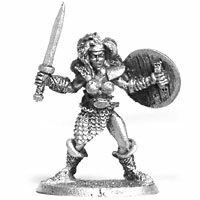 Aimed at the collector and painter, Dark Sword do 10 incredible miniatures of Amazons in their Miniature Masterworks series, based on fantasy painting by leading artists. Some of these are limited editions (usually those with little clothing on) so get them while you can! 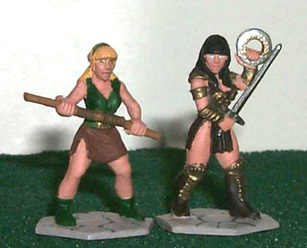 Back to the cavegirls in bikinis, though with iron-age weapons, with these 2 Amazons from Alionas. 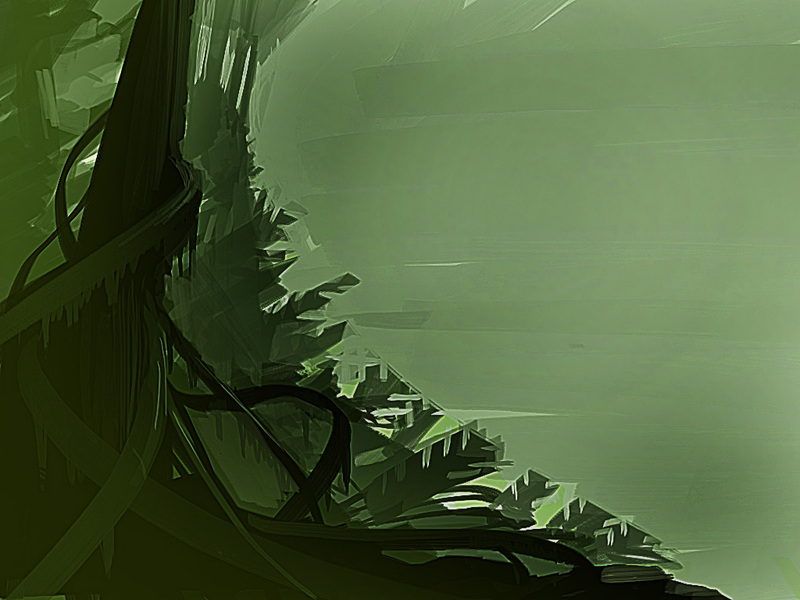 The painting and photography aren't up to much and may be hiding 2 good sculpts. 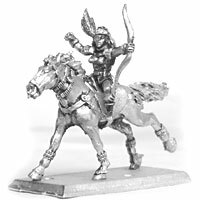 Another relatively new company, Masquerade sell 30mm miniatures, including 1 Amazon with bow. She's lost a boot somehow (must have been one hell of a night), but is very pert and attractive in an elfin way. MSB produce a very distinctive range of fantasy figures, although their Amazon is comparatively understated. Very unusual leg warmers and suffers a bit from spindly leg syndrome, but overall a nice sculpt. This Spanish company produce 2 rather fearsome Amazons, including the headslicer warrior woman with male victim on her belt, pictured below. These are of comparable size to GW miniatures. 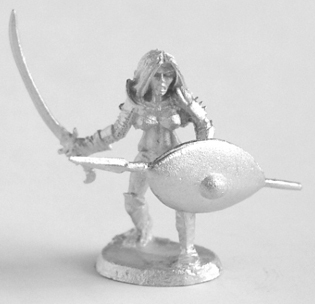 In their fantasy section, Denizen has produced one Amazon guard with spear. 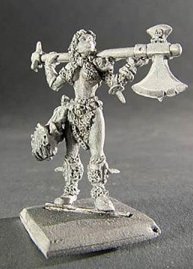 Very well sculpted but Denizen have stuck to 25mm so mixing with larger figures might be a problem. Viking Forge acquired the old Asgard range, including 15 Amazon miniatures. Unfortunately there are no pictures, so I can tell you little about them, except that they are very cheap. 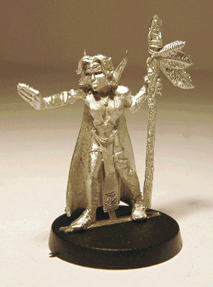 Pre-painted plastics are not everyone's cup of tea, but Wizkids produced several Amazons with potential across the Mage Knight ranges. The Amazon armed with a man catcher is particularly worrying - not so much as catching men but separating men from their extremities. The Mage Knight ranges are no more, but no doubt these will be a regular feature on Ebay for some time (Don't forget the 2 metal Mage Knight Amazons available from Ral Partha Europe). The first figure here not described as an Amazon, Dragonblood make Xitllali, Priestess of Aztatlán, very Meso-American in style and would fit in well with GW's range of amazons. No Amazon list would be complete without a certain warrior princess and her trusty if soppy sidekick, and happily GZG provide them. The only drawback is that they are 25mm so would not fit in well with the later Amazon ranges. GZG also produce 5 cavegirl figures. Primarily producing large scale miniatures, El Viejo Dragon also produce this 1/43 scale of Amazon Hoplites, worth a look for diorama possibilities as obviously they are too large to fit in with other ranges. Well, that's it. Have I left any Amazons out? Please feel free to contact me through the Frothers forum and I'll make amends. I'll also keep an eye out for new ranges becoming available.